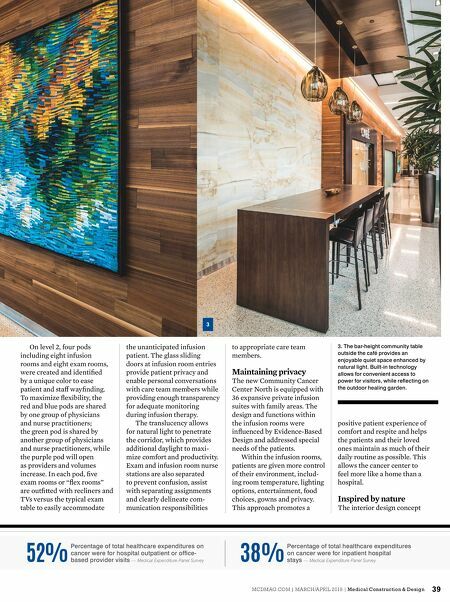 MCDM AG.COM | M A RCH /A PR IL 2018 | Medical Construction & Design 39 On level 2, four pods including eight infusion rooms and eight exam rooms, were created and identifi ed by a unique color to ease patient and staff wayfi nding. To maximize fl exibility, the red and blue pods are shared by one group of physicians and nurse practitioners; the green pod is shared by another group of physicians and nurse practitioners, while the purple pod will open as providers and volumes increase. In each pod, fi ve exam rooms or "fl ex rooms" are outfi tted with recliners and TVs versus the typical exam table to easily accommodate the unanticipated infusion patient. The glass sliding doors at infusion room entries provide patient privacy and enable personal conversations with care team members while providing enough transparency for adequate monitoring during infusion therapy. The translucency allows for natural light to penetrate the corridor, which provides additional daylight to maxi- mize comfort and productivity. Exam and infusion room nurse stations are also separated to prevent confusion, assist with separating assignments and clearly delineate com- munication responsibilities to appropriate care team members. Maintaining privacy The new Community Cancer Center North is equipped with 36 expansive private infusion suites with family areas. The design and functions within the infusion rooms were infl uenced by Evidence-Based Design and addressed special needs of the patients. Within the infusion rooms, patients are given more control of their environment, includ- ing room temperature, lighting options, entertainment, food choices, gowns and privacy. This approach promotes a positive patient experience of comfort and respite and helps the patients and their loved ones maintain as much of their daily routine as possible. 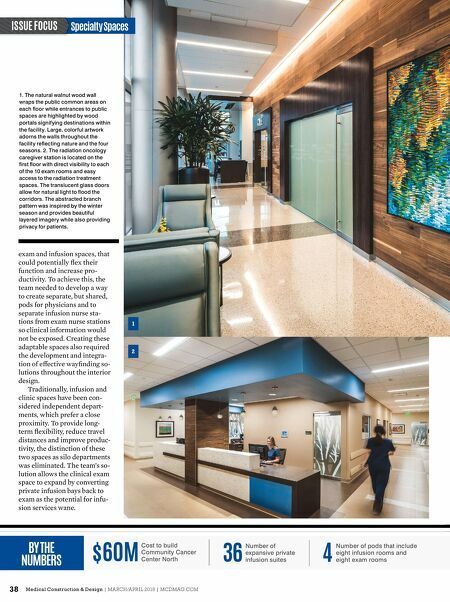 This allows the cancer center to feel more like a home than a hospital. Inspired by nature The interior design concept 38% Percentage of total healthcare expenditures on cancer were for inpatient hospital stays — Medical Expenditure Panel Survey 52% Percentage of total healthcare expenditures on cancer were for hospital outpatient or offi ce- based provider visits — Medical Expenditure Panel Survey 3 3. The bar-height community table outside the café provides an enjoyable quiet space enhanced by natural light. Built-in technology allows for convenient access to power for visitors, while refl ecting on the outdoor healing garden.